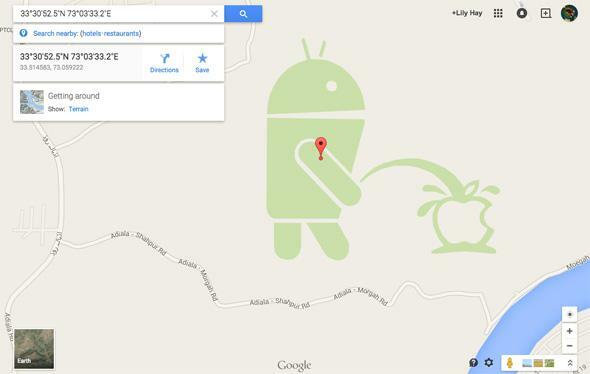 Android robot urinating on an Apple logo in Google Maps. Do Robots Urinate? And Other Questions Raised by This Google Maps Prank. There are just so many questions about this Android robot urinating on an Apple logo in Google Maps. Is it accurate to depict a robot peeing? If you want to support Google over Apple, isn’t this a weird way to do it, since you’re just getting runoff urine all over a Google product? We could go all day. First spotted by Cult of Android, the image shows up near the Pakistani city Rawalpindi. It doesn’t show up in Satellite View, so that rules out the possibility of a masterful crop circle. The vast majority of users who edit our maps provide great contributions, such as mapping places that have never been mapped before, or adding new business openings or address changes. We’re sorry for this inappropriate user-created content; we’re working to remove it quickly. We also learn from these issues, and we’re constantly improving how we detect, prevent and handle bad edits. 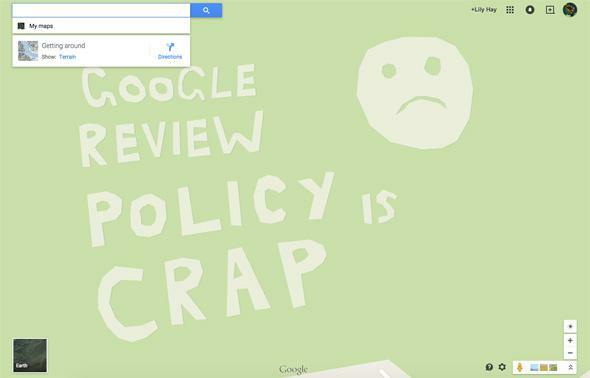 The Guardian points out that a few miles east of the Android/Apple situation someone has added a “Google review policy is crap :(” message. So, yeah, it seems like someone figured out how to game Google’s Map Maker feature and then added these images to make a statement. The whole thing is reminiscent of a similar, but less visually impactful, prank from last week in which users got a snowboard shop called “Edward’s Snow Den” verified on Google Maps and then changed the address to make it look like Edward Snowden was inside the White House. Google says it learns from these situations, but the takeaway seems to be that the company needs a better approval system for Map Maker and verified locations. Otherwise things like this will probably, you know, keep happening.